We present an algorithm for the enhancement of contrast in digitized archive photographic prints. It aims at producing an adaptive enhancement based on the local context of each pixel and is able to operate without direct user's intervention. A relation between the variation of contrast at different resolutions and the local Lipschitz regularity of the image is exploited. In this way, each pixel is defaded according to its nature: noise, edge, or smooth region. This strategy provides for an algorithm that drastically reduces typical, annoying artifacts like halo effects and noise amplification. Antique photographic prints are very often subject to fading. 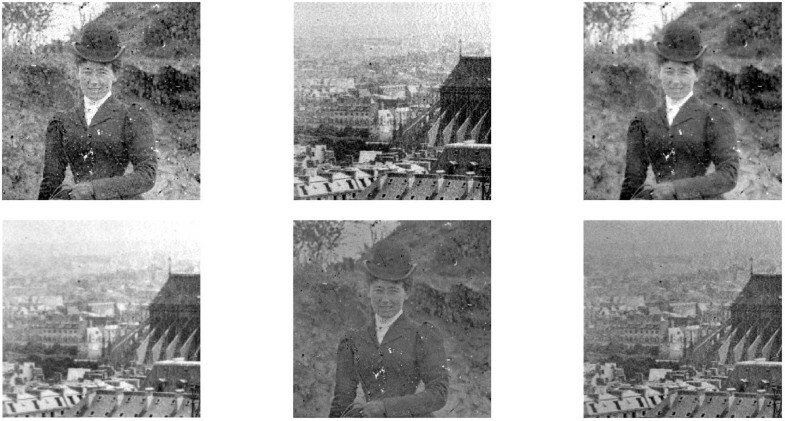 Two typical examples of faded images are shown in Figure 1. Fading can be described using a model based on silver oxidation. The intensity and speed of this process are extremely variable and depend on the technology used to get the print as well as on the way the print under consideration was processed. Indeed, several factors influence the stability of a print. In the oldest salted papers, fading can be traced to the presence of sulphur. Its source may be intrinsic, due to hyposulphites left in the paper, or extrinsic, from the atmosphere . A proper storage environment with controlled temperature and humidity is of course essential in order to preserve the quality of the original art. In particular, humidity is the prime factor to be considered for black and white prints. The lowest possible temperature that keeps the relative humidity (RH) under 30 percent should then be chosen . However, in many cases the prints may have been placed in such an environment only recently, after the fading itself has manifested. Moreover, items exposed at exhibitions, or handled often, are particularly subject to degradations. Two typical examples of faded photographic print: Horse rider (a) and Arena di Pola (b). In order to enable the researcher or the public at large to visualize an image of the faded photograph as similar as possible to the original one, digital acquisition and processing is the only possible approach. Photographic archives acquire their images using professional scanning equipment and create digital versions of their art. The latter can then undergo a process of "virtual" restoration, for example, through a proper contrast enhancement algorithm. Contrast enhancement is a well-known and challenging problem in image processing. In general, it aims at a recovery of the original vividness of images having a suboptimal contrast. A wide range of approaches have been proposed in literature in both the spatial and transform domains. Examples in the transform domain are alpha-rooting techniques, and techniques based on scaling the DCT coefficients. Alpha-rooting was first presented in , and it has been successively modified in [4–6], since it can be combined with different transforms. A recent version of alpha-rooting is described in ; it is based on properties of a tensor representation of the DFT. A DCT-domain operation is suggested in , where all the three attributes of brightness, contrast, and color of an image are addressed. It is based on a simple and computationally efficient algorithm, that only requires scaling of the DCT coefficients—mostly by a factor which remains constant in a block. In the spatial domain, in addition to the use of simple linear techniques which emphasize the high-frequency contents of an image (the so-called unsharp masking approach), the most famous approaches are probably the Retinex model, based on Land's studies , and histogram equalization . A set of modifications has been proposed for the improvement of these methods. In particular, it is interesting to note that both methods have evolved to include a multiscale (i.e., multiresolution) version, based on convolution with smoothing kernels. The evolution of the methods has incorporated the estimation of a context, based on a global measure in a suitable neighborhood, allowing adaptive enhancement [11–14]. In fact, there is a general agreement about the fact that these two factors greatly improve the performance of any contrast-enhancement framework . However, they are also responsible for unavoidable undesired artifacts like oversmoothing (with a loss of details) or excessive enhancement (with a resulting amplification of noise and/or halo effects) . Even though some sophisticated approaches have been proposed for their reduction [17, 18], these artifacts remain an aspect to be considered in the design of any contrast-enhancement framework. The situation is even more difficult when scanned antique photographic prints are processed. In this case, the presence of defects in the original art may introduce specific artifacts in the digital item, which in turn produce particularly annoying effects if conventional enhancement techniques are applied. In this paper we present an adaptive enhancement tool that tries to overcome the above-mentioned problems. It is based on a multiscale approach that exploits the local context. In particular, it exploits the link between the change of contrast (as the resolution is increased) and the local Lipschitz regularity of the image [19, 20]. Such a link can be used for asserting the (possibly) noisy nature of each pixel, avoiding convolutions with kernels that would introduce the aforementioned artifacts. On the other hand, a measure of contrast at different resolutions allows to exploit visibility laws, such as the Weber-Fechner law; they are used in the assessment of the importance, and then the enhancement of each pixel of the image under study. After the pixels have been classified (edge, noise, or smooth region), their contrast is changed appropriately. Then, at a successive stage, an optimal (global) gamma correction tool that exploits the results in  is performed. The proposed framework has been tested on various digitized historical photographic prints subjected to fading. Experimental results show good results in terms of subjective quality and a good efficiency even in critical cases. To make a more objective evaluation of the results, comparisons with representative contrast enhancement methods have been introduced. Moreover, several quality measures have been used to quantify the visual appearance of the restored images. The paper is organized as follows. Section 2 presents the proposed model; it includes the detailed algorithm and a description of each of its three phases. Section 3 contains some experimental results and comparative studies. Finally, some discussions, conclusions, and guidelines for future research are the topic of Section 4. The proposed method, initially explored in , consists of three main stages. In the first one, the image is preprocessed and its pixels are classified according to the inferred type of damage suffered. 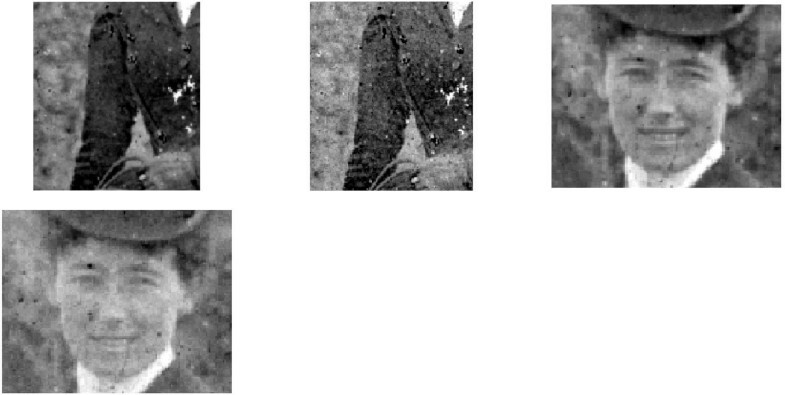 In particular, we check if a pixel belongs to a blotch (a common fault in antique photos) in the image. This operation allows for a more appropriate estimation of the parameters in the two remaining stages. In the second stage, the link between the local Lipschitz regularity and the change of contrast of the image across scales is exploited; after this stage, adaptive contrast enhancement can be performed on the faded image. The aim of the second stage is to differentiate the type of defading to be applied to each pixel according to its nature (edge, noise, or flat region). In the third stage, the image is defaded using a contrast-enhancement tool that is based on the classical characteristic curve , with (as in gamma correction). In order to automatically estimate an optimal value of , we exploit the results presented in  that are based on the following observation: visually pleasant images show a sort of orthogonality between the local first moment and the local second central moment of the distribution of the luminance values. It is interesting to note that  reports a statistical independence between luminance and contrast in natural images. (Mante et al. use the weighted sums and to measure local contrast and luminance, resp., where is the pixelwise luminance, and the weights decrease with the distance from the center of the context.) In the following, the aforementioned stages are described in detail. In the first stage, roughly called deblotching, the regions with a color that is stronger than the more common (faded) colors in the remaining parts of the image are detected. We use the term "strong" here since, for achromatic images, to say that a region is saturated black or white is perhaps misleading. Observing such dark and bright blotches in Figure 1, it can be seen that there are two main reasons for performing deblotching. First, blotches would increase their appearance after any contrast enhancement operation with the result that the defaded image would be conspicuously spotted, compromising its global visual quality. The second reason is that blotch pixels have statistical properties that are different from those in the rest of the image. Hence, to ignore blotch pixels allows an improved estimation of the parameters in the remaining stages. 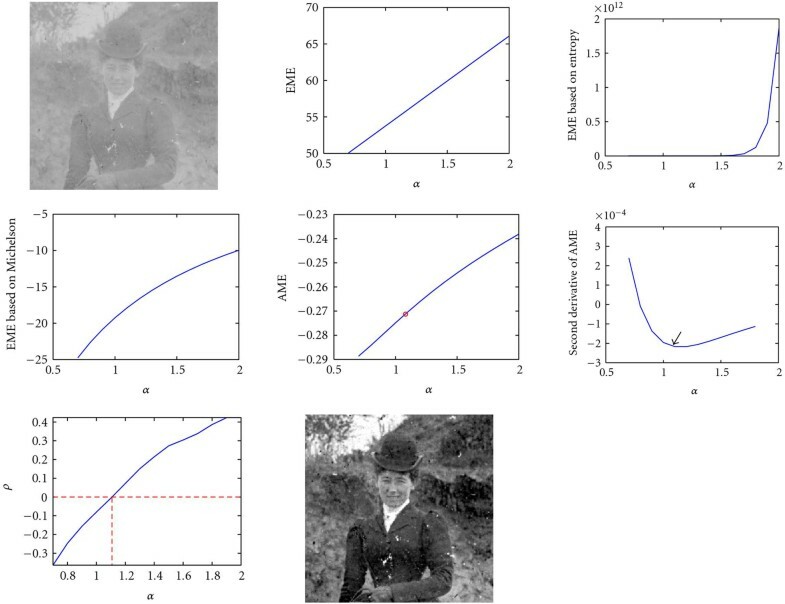 Contrast matrices of the images in Figure 1.
where is our faded image, is the mean of the intensity in a region centered in and is a scale (or resolution) parameter. With this definition, which pretty much agrees with Weber's law, blotches become outliers and can be easily detected by straightforward thresholding applied on . The threshold can be either tuned manually or set at , where is the standard deviation of . The latter choice is robust under the hypothesis that blotches are evident on this kind of images, as shown in Figure 1. Even though the detection method we propose may seem blunt, it is perfectly acceptable in the context in which it is used. In other words, it is mainly a preprocessing tool which makes the successive computation of the Lipschitz factor more correct—see Figure 3. It is worth noticing that the contrast in (1) is considered with its sign. This enable us to distinguish between pixels that are darker or brighter than their background and then to apply a proper enhancement. Map of blotches of images in Figure 1. The phenomenon of fading is often accompanied by noise resulting from a chemical degradation of the photographic emulsion. The aim of this stage is then to produce an image where the contrast of each pixel is changed depending on whether it is part of a noisy, an edge, or a flat region. The analysis carried out in this section is local; global corrections are addressed in the third phase. We are interested here in analyzing the link between the pointwise Lipschitz regularity and the variation of contrast of the image. It is well-known that the Lipschitz coefficient gives information about the (possibly) noisy nature as well as the regularity of each point . where the integral is a polynomial function whose degree does not exceed , as proved in the appendix. It turns out that is a polynomial function with respect to where while Hence ( means that has the same order of ). It is important to notice that the result above permits to impose some constraints on choices usually made by hand in other methods proposed in literature. First of all, only two scale levels are required for the discrimination between noisy and uncorrupted points of the faded image. Indeed, taking into account the pointwise nature of the noise, two levels among all the possible ones can be selected. Furthermore, no additional thresholding is required for discriminating the nature of each pixel and selecting the corresponding enhancement function. Finally, the size of the context used for the computation of the contrast coincides with the support of the regularizing function, and the mean can be seen as the convolution between the image and a Haar basis function at a given scale. It is obvious that the aforementioned considerations are valid just in case of contrast enhancement under noise and not in general. In the latter case, the parameters above have to take into account the local frequency information of the image as well; consider, for example, textures. This would imply the use of a more sophisticated measure of contrast that would take into account not only the spatial information (local mean) but also the frequency (in terms of dominant frequency values) in the same region. Coming back to (6), the value of can be used in a power-law correction. In fact, considering the contrast enhancement map , we have the effects shown in Figure 4: a lower enhancement for noisy pixels ( ) than for uncorrupted points ( ). Moreover, where the regularity is higher (larger s), a stronger enhancement is performed. In other words, the contrast of flat regions is increased, giving the image the vividness characteristic of natural images . On the contrary, edges (characterized by smaller but still positive s) are slightly less enhanced, avoiding the halo effect which is common to many contrast enhancement approaches. It is worth highlighting that the aforementioned effects are based on the hypothesis that the gray levels of a faded image are located in the highest portion of the intensity range. Representative curves of the correction in the 2nd phase: dotted, solid, and dashed. Summing up, this phase permits to obtain an image that, even if still faded, has been changed in a space-varying way in agreement with its local regularity. As a result, its noisy pixels are less emphasized while the contrast of uncorrupted points is increased accounting for their context, as it is shown in Figure 5. Output of Phase 2 for the images in Figure 1. To complete the defading process, a global (i.e., uniform in the image) luminance mapping is applied. It is based again on a power-law function, . This mapping depends on the choice of the parameter which is made using an image quality measure. The distribution of the local standard deviation with respect to the local average of the luminance has been recently used in order to define a figure of merit that was used in a restoration algorithm applied to faded images . It has been shown that these two statistical parameters live constrained in a bell-shaped region of the plane ( , ) . We use here the same approach, in order to get an estimate of the optimal values of the parameters used in the algorithm described above. Let us suppose that we acquire a digital image from a given real-world scene using an ideal linear device and consider only its luminance values for simplicity. We subdivide the image into adjacent blocks, and calculate the standard deviation and the average of the luminance or gray level within each block. In the ( , ) plane each block is then represented by a point. If we imagine to repeat this procedure for a huge set of scenes with all sorts of conceivable contents, and to display the corresponding values ( , ) in a single plane, we will probably get a cloud of points showing no correlation between and . There is no reason indeed why the average of the luminance of an object in the real world should influence the standard deviation of the same luminance. Notice that this consideration does not contradict Weber's law, which is related to our perception of the scene, and is not a property of the scene itself. The situation is different if, as it happens in practice, the dynamic range of the acquisition device is limited; in this case, very dark and very bright blocks present a limited deviation. In fact, it can be demonstrated that the values of lie now in a limited range bounded above by a bell-shaped function of the average; the function takes its maximum value when the average is half the available range and falls to zero when the average corresponds to the minimum or the maximum of the luminance range . values obtained as a function of and corresponding average values of the output image for Horse Rider (a) and Arena di Pola (b). tends to assume negative values for the degraded picture. After the processing, the shape of the cloud of points in the ( , ) plane corresponds to values of close or equal to zero. Thus, we use closeness of to 0 as a quality criterion for the choice of the parameter in Phase 3, as it will be shown in the following section and in Figure 6. In LIP arithmetic (assuming the bounded range [ ] for the intensity magnitude) one has, for f and g intensity values and a real scalar, ; ; , and . LIP arithmetic has the important advantage of respecting the bounded luminance range, for example, [ ], of an image; also, Weber's law can be expressed in LIP arithmetic. Thus, LIP arithmetic is advisable when the result of the operation is to be used as an intensity value, and perhaps also in the present case since LIP arithmetic is related to human visual perception issues. The entropy version AME2 stresses the importance of uniformly distributed local contrast. The mentioned quality indicators will be considered in the experiments described in Section 3. For each pixel , compute the contrast matrix at a given scale , as in (1). Compute the standard deviation of . Hard threshold using as threshold value . Let . Compute at another scale level . Estimate using (6) if , else . Pointwise correct through the function . (ii)compute using (7) and select . Then, stretch using the optimal . It is worth stressing that sepia images are the input of the proposed algorithm. For this reason, only their luminance component has been processed and is shown; the two chrominance components can be kept unchanged if desired. The proposed framework has been tested on various images coming from the Fratelli Alinari Archive in Florence, Italy. In this paper we consider the two images shown in Figure 1 and the ones on the left side of Figure 8. All the images show evident opaque blotches. Using blocks of size pixels as the context for computing the local contrast in 1, the maps of blotches achieved in the first phase are quite satisfactory: almost all the blotches are detected, as shown in Figure 3. In the second phase, the estimate of the pointwise requires the computation of the contrast at two different resolutions. Along with the size already used in the first stage, a square window of size is used here. It is worth emphasizing that very similar values of the corresponding are obtained for different choices of the window size. This is encouraging since the estimate of the pointwise in (6) does not consider the constants. 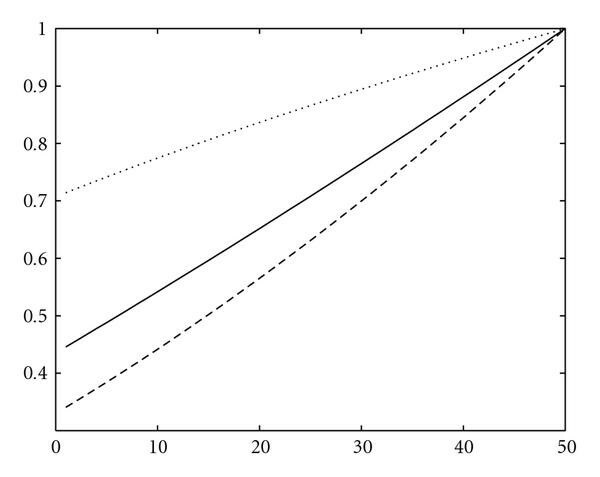 Performing the correction through the characteristic curve we achieve the result in Figure 5. It can be noted that the resulting images are still faded but with a drastic reduction of the relative noise contribution. The output coming from the second phase is finally enhanced via a curve in the third phase. is a global parameter (one for all image pixels) and in our experiments it assumed the following values , , , and respectively, for the Horse rider, Arena di Pola, View, Woman Face, and full size Horse Rider images. They have been selected in correspondence to since a good matching exists with the perceived image quality. Figure 6 shows the values obtained as a function of for the two test images Horse Rider (left) and Arena di Pola (right). They exhibit a smooth and monotonic behaviour; the optimal values of are indicated as those for which . The final results for the adopted images are shown in Figures 7 and 8 (right). Output images of Phase 3 for the test images in Figure 1. "View", "Woman Face" and full size "Horse" faded images (left) and corresponding defaded images using the proposed model (right). 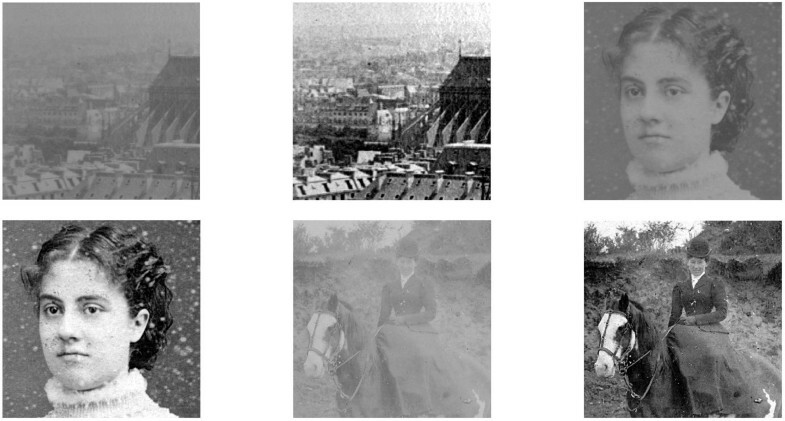 Top to bottom, left to right: faded Horse Rider image; EME, EME with entropy, EME using the Michelson contrast, and AME quality measures, as defined in ; second derivative of AME with respect to ; values obtained as a function of α; defaded Horse Rider image obtained using the optimal α value. It is worth noticing that the AME measure has an interesting point in correspondence to the main change of curvature (minimum of its second derivative with respect to α), which coincides with the optimal α value selected by the scheme. To test the visual quality of the results, we use four of the quality measures proposed in , as alternative measures to the distribution. They, respectively, are , with entropy, using the contrast of Michelson, and , and they have been evaluated in the third phase of the algorithm for each value of (global enhancement parameter). As depicted in Figure 9, they increase with —see also Table 1. The problem is now to define some critical points in these curves that could be related to the quality of the image. To this aim, for simplicity we analyse the measure that, as we saw in Section 2.3, is an entropy-based measure related to the Michelson contrast. An interesting aspect concerns its curvature. In fact, its second derivative shows a minimum (a "good point") that corresponds to a main change of curvature. It is interesting to note that it occurs also in correspondence to the optimal value of , as selected with the scheme (see Figure 9). values and quality metrics of the corresponding corrected image, as depicted in Figure 9. It is important to stress that all the involved parameters in the proposed model are automatically tuned. In particular, this is true for the adaptive enhancement based on Lipschitz regularity and for the estimation of the global enhancement factor. In fact, the main property of the latter approach as a quality measure is the fact that the good point is univocally determined for each image. On the contrary, conventional multiscale methods often require to tune more than one threshold—depending on the adopted nonlinear contrast-enhancement function, the allowed level of noise, and the employed quality measure. Figure 10 shows the enhanced images obtained using the wavelet-based method in  (left), a simple linear contrast stretching (right), and the -rooting method in . Neither is satisfactory: in the first case, noise is still visible, in the second one highly detailed regions are excessively smoothed, and in the third one the image is grayish with emphasized bright details. On the contrary, as Figure 11 shows, the defaded image using the proposed approach has vivid colors, well enhanced edges, and no oversmoothed regions. From top to bottom: defaded Horse rider (left) and View images ( right ) using the adaptive multiresolution method in , a linear contrast stretching and the α-rooting approach in [ 5 ]. Left : Zoom of Horse rider, defaded with the proposed scheme. No halo effects appear, and there is neither oversmoothing nor excessive noise enhancement. Right: Zoom of Horse rider, defaded with the adaptive multiresolution method in  (top), and with linear contrast stretching (bottom). The restoration application we address is not characterized by real-time needs; nonetheless, the operations performed by the proposed algorithm are very simple and the required computing time is comparable to the ones required by the mentioned competing approaches. In this paper we have presented a framework aimed at giving faded images their original vividness. After the application of an adaptive technique of contrast enhancement that exploits the link between local Lipschitz image regularity and the change of contrast, a global power-law correction is performed. The proposed model allows for a gradual enhancement of the image that avoids drawbacks like halo and noise amplification. In a forthcoming paper we explore further the theoretical framework presented in Section 2.2, using more sophisticated bases such as those in . For the specific usage on faded photographic prints, the experiments we have performed indicate that the proposed method gives a satisfactory performance. However, a few issues should be addressed in future works. First of all we observe that the estimate we use for the Lipschitz regularity is slightly noisy; this affects in particular quasihomogeneous areas where the contrast is very low. An improved definition of contrast that permits a stronger dependence of the power-term correction on the local characteristics of smooth image areas should be devised. Finally, it would be convenient if an optimum balance between the local and the global correction stages could be automatically attained, since the ( , ) method does not yield a satisfactory input for this purpose. For pictures having a nonuniform exposure to light, it would be more reasonable to differently treat two or more portions of the image itself. In this case, some user intervention would be required. This work has been supported by the Italian Ministry of Education as a part of the Firb Project no. RBNE039LLC. The authors wish to thank F. lli Alinari SpA for providing the pictures used in the experiments. The aim of this appendix is to show that the local background , defined in (3), of a polynomial image of degree is still a polynomial function of degree , with . It turns out that the local background is a polynomial function whose degree does not exceed .